The diaphragm is the main respiratory muscle; it separates the chest cavity from the abdominal cavity. It can be injured by itself or as a part of multi-trauma to the chest and abdomen. The liver, spleen, and stomach are attached to the diaphragm with parts of the fatty tissue in the abdomen, the bowel, and the colon also attached to this large muscle. The diaphragm has more functions than just the respiratory system. It is involved in having a bowel movement, urinating, throwing up, coughing, giving birth, and swallowing. It can allow for a deep breath by itself, even if no other respiratory muscles are participating. Perforation of the diaphragm can lead to sudden changes in a body’s physiology. The abdominal contents can push upward through a hole in the diaphragm, resulting in a diaphragmatic hernia. This can compromise both the heart and respiratory function. The lungs can shift to one side, away from the side of the rupture. Like any hernia, it can become strangulated so that the stomach or bowel can lose circulation and result in cell death. The incidence of injuries to the diaphragm after blunt trauma ranges from 1-7 percent. The incidence of injuries to the diaphragm after penetrating trauma to the torso is about 10-15 percent. It is not generally considered a lethal trauma and many survive after identification and repair of the diaphragmatic injury. About 75 percent of all diaphragmatic injuries occur on the left side of the chest. This is felt to be due to the protection of the right side of the diaphragm by the liver. Right sided trauma to the liver usually means that there is a higher energy force involved in the injury and mortality rate is higher. Penetrating wounds usually affect the left side of the diaphragm because most gun assailants are right-handed. Because blunt traumas of the diaphragm involve high energy impacts, there are often other injuries. Some of these other injuries include traumatic brain injury (in half of all diaphragmatic ruptures), pelvic fractures, fractures of long bones, and rib fractures. There can also be solid organ injuries of the abdomen, a pneumothorax, heart injury, bruising of the lung, and lacerations of the lungs. The diaphragmatic injury is often not picked up right away because of the other, more pressing, injuries, which make it difficult to make an immediate diagnosis. 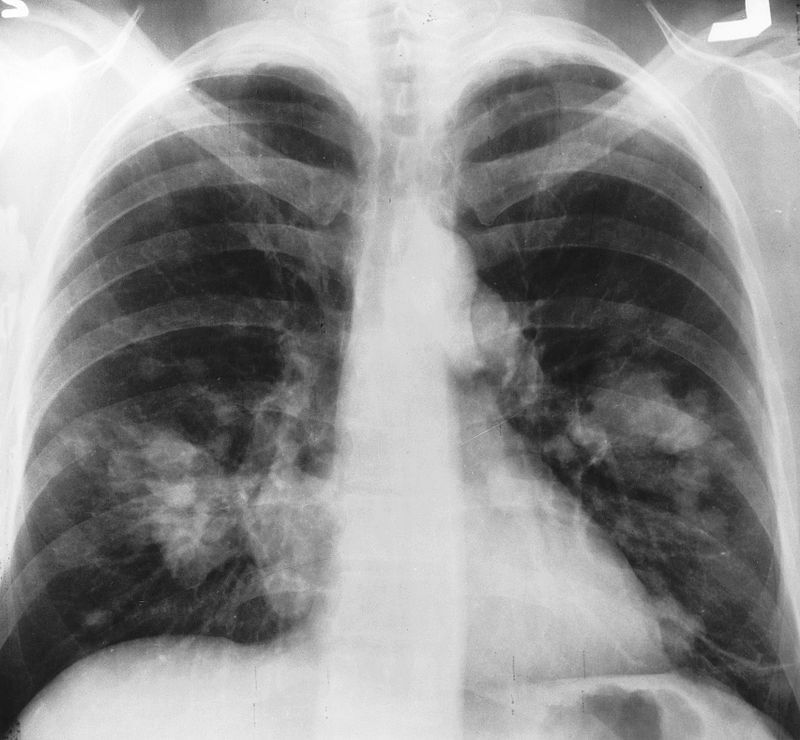 The best test to identify a diaphragmatic injury initially is a chest x-ray. This can show the presence of the stomach or other hollow organ above the presence of the diaphragm. Loss of a smooth contour to the diaphragm can indicate that the diaphragm has been ruptured. A CT scan of the chest and abdomen is perhaps a better test, showing an obvious hole and extrusion of contents of the abdomen into the chest cavity. Contrast dye studies in which dye is swallowed and the doctor looks for the presence of dye above the level of the diaphragm can also show the presence of a hernia in the diaphragm. MRI examination will show excellent resolution of a hole in the diaphragm. Even ultrasound can be found to be helpful in some circumstances. There are two steps to repairing diaphragm injuries. The first is putting back the abdominal contents where they belong. The second is creating a water-tight seal between the chest cavity and the abdominal cavity. It is usually done as part of an exploratory laparotomy when the surgeon is looking for other findings inside the abdominal spaces. The close the diaphragm can be seen by moving the spleen away from the diaphragm (on the left) and moving the liver away from the diaphragm on the right. A ligament has to be cut before the liver can be effectively moved away from the right diaphragm. It is usually not difficult to bring the abdominal contents back inside the abdomen during surgery. Sutures are used to close the defect in the diaphragm after dead tissue has been removed from the affected area. If the bowel has been perforated, infection can pass up through the diaphragm before its repair, leading to a pocket of pus called an empyema collecting in the lung space above the diaphragm. Sometimes the chest cavity can be washed out to prevent the infection from passing up into the chest cavity. The diaphragm can also be repaired from the chest side of things if there is a lot of blood in the lung space from a laceration of the liver and diaphragm on the right side. Late diaphragmatic hernia repair is done when the rupture of the diaphragm was not picked up on right away and gradually the abdominal contents drift up into the chest cavity. These can be more difficult to repair as the abdominal contents gets trapped and stuck inside the hole in the diaphragm. In such cases, it is better to repair the diaphragm from the thoracic side of the diaphragm so that adhesions to the lungs can be teased away from lung tissue. Defects in the diaphragm of up to 8 cm can be repaired without having to use a diaphragmatic graft or reconstruction of the diaphragm. The outcome of a diaphragmatic injury depends on the number of other injuries present. The mortality rate varies from 18 percent to 40 percent. Complications include pneumonia, fluid in the lung space, sepsis, liver abscess, pus in the lung space, and multi-organ system failure. Patients who have gastrointestinal obstruction have a higher rate of complications and death.